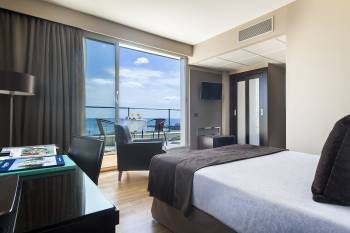 Located in Barcelona right on the beachfront and a few meters from international congress centre CCIB, the hotel has 177 rooms with direct telephone line, internet connection, satellite TV, air conditioning, full bathrooms with bathtub or shower and hair dryer. Some of them adapted for handicapped people and some with sea views. In the hotel you can enjoy our fitness room, with cardio machines, sauna and steam bath. Also you can use our business centre with computers connected to internet and our restaurant where you will taste a large variety of Mediterranean cuisine. There is own parking available in the same building. The hotel has 6 meeting rooms with audiovisual equipment, natural light, in front of the sea and high speed internet connection. They are the ideal place for the celebration of your meetings, conventions, banquets and all kinds of social events. Our hotel and meeting rooms are situated in Diagonal Mar district of Barcelona with easy access to both the City and the seafront. Housed in the ground floor of the building you will find the 6 meeting rooms with natural daylight in the same corridor, our meeting rooms are beautifully decorated and perfect for training sessions, interviews or conferencing.We offer highly flexible meeting room capacities at this sea view venue and can take up to 120 delegates. Our highly trained staff is n hand to ensure that your meeting, training session or conference runs smoothly.We offer fully flexible room layout and seating configurations with wi-fi free and all audiovisual equipment you may need upon request.You and your clients will be greeted at reception and personally shown to your meeting room. We take care everything so you can focus on your meeting.